There is a simple forecast that is built on assumption that the stock market has a cyclical nature. The cycles may not be stable all the time but the probability of repeating cycles can be high enough to use the cycles by stock traders and investors for their benefits. The cyclical nature of the market can be masked by more powerful factors (fundamental data, bad/good news, global events, etc.) that over-drive the market time-from-time. Many technical analysts use cycle predictions in their comprehensive analysis. One of the result-sensitive parameters in the cycle analysis prediction is a historical period that used to extract the cycles from a curve. The prediction can be very different depending on the historical period that is chosen. 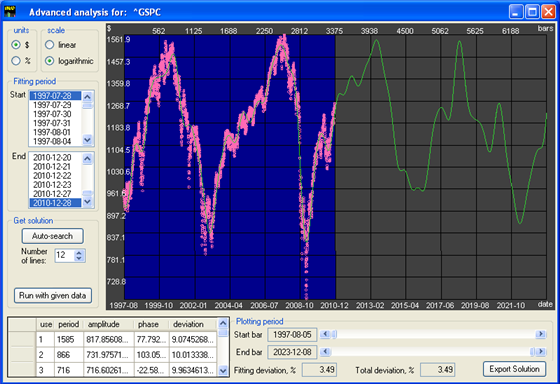 One of the stable cycles that is observed for the recent decade is a seven-year period. The chart below shows S&P-500 index forecast for the next several years. 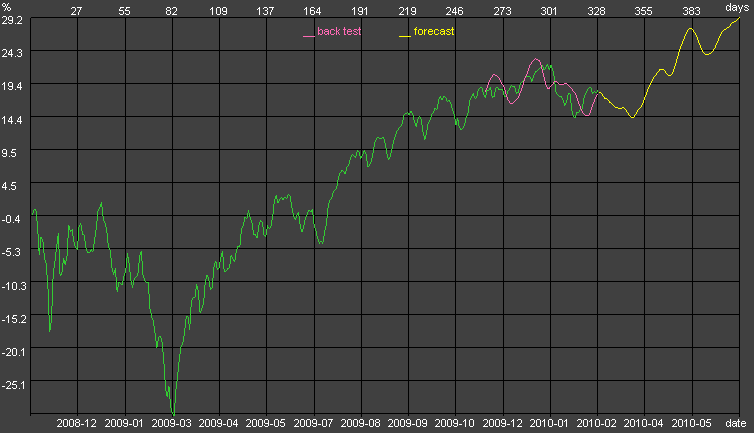 The calculation has been performed using Stock Market Predictor SMAP-3. According to this forecast the stock market might continue its uptrend with natural short-term small-amplitude sub-cycles until 2012-2013. Technically, S&P-500 index expected to be bullish during the period of October 4-15, 2010. 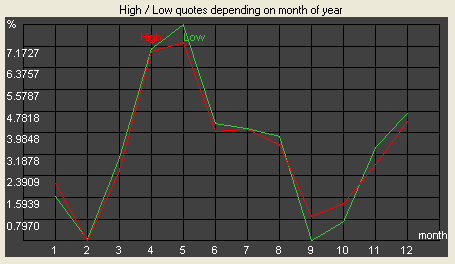 According to the results of two different software tools for stock market, the behavior of the index is predicted as somehow between uptrend and sideways. However, technical predictions may be overwritten by changed fundamental-based expectations. The technical indicators are built on a historical predisposition and may work well if other informational factors are unavailable or new information still keeps the existing balance of future expectations. Technical methods are unable to predict most fundamental news, for example, the numbers of GDP or unemployment rate that will be announced. A possible prediction is a slight downtrend until September 28 and then uptrend. 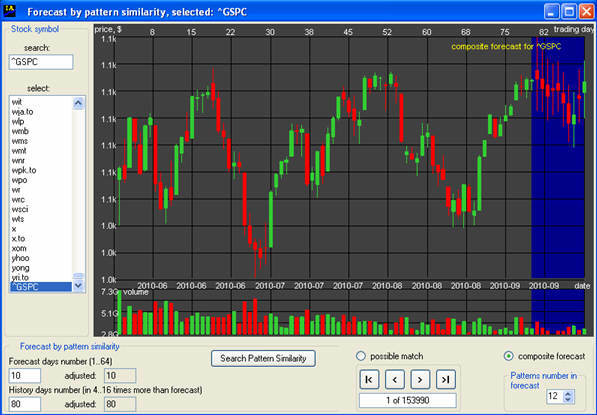 Pattern similarity method predicts stock market downtrend-uptrend reverse during the last two weeks of July 2010. The chart below was calculated and plotted using Investment Analyzer InvAn-4. 80 historical days are used to predict within next 10 trading days. With settings for 10 best matches, the Analyzer scans among 153990 cases. The chart shows that S&P-500 index may continue a downtrend with fluctuation then gradually reverse to a moderate uptrend. The reverse point is expected on July 21 with a minimum value around 1050. InvAn-4 searches for the best match from internal database by scanning all historical data. It ranks all possible matches on the basis of minimum deviation and maximum correlation within given historical period. Pattern matching is performed using open, high, low, and close prices and volume data. When scanning is completed, it composes forecast using several best matched patterns (top ranked). The composite result is built as a weighted average with weights proportionally patterns’ ranks. 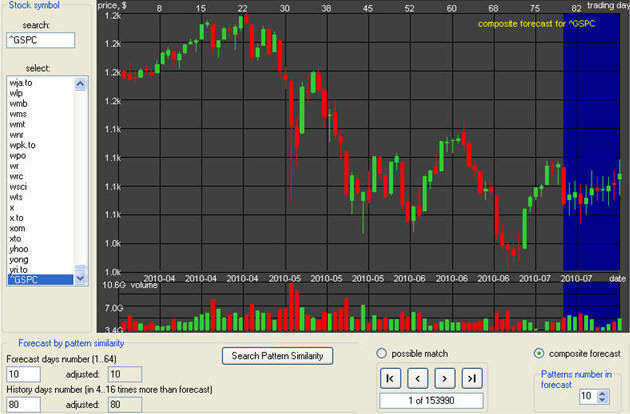 The number of patterns that form composite forecast can be adjusted. The US unemployment rate decreased to 9.7% in May, after rising to 9.9% in April. However, the economic growth in the first quarter was slower than expected; it grew at a 3% annual rate from January to March. Consumers and businesses spent less than first estimated. US trade deficit was a drag on economic activity. Also US housing market started falling more than expected in May to a five-month low as a home-buyer tax credit expired. Evidently, fears continue to dominate investor decisions because of the debt crisis and financial regulatory reforms. It looks like many investors still watch for better moments to re-enter the stock market. An additional factor is seasonal – since summer almost always has been a sluggish period for stock investing. Nevertheless, S&P-500 index showed some strength for two weeks of June – the biggest two-week gain since November. The recent 13%-drop in May could be a healthy correction. Normally a correction is defined as a drop more than 10% from a recent maximum. We can calculate respectfully the third order derivative Δ3, which can be described as speed of changing acceleration. It can be considered as an indicator of panics in the stock market – the more its absolute value is, the more nervous investors behavior in stock market is. The charts have been calculated and plotted by Investment Analyzer Inv-An-4. According to a revised cycle analysis forecast, SP-500 index performance until April 7, 2010 expected to be positive. Evidently, previously predicted negative move was reversed by good fundamental news. 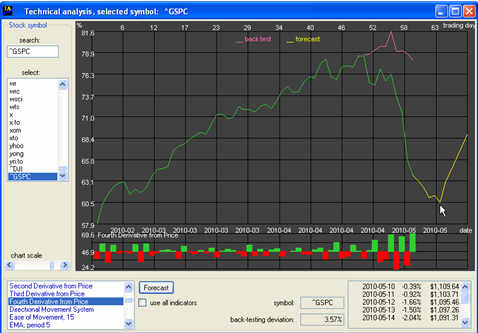 The chart has been plotted using Stock Market Analyzer-Predictor SMAP-3. Nothing in this piece or in this blog should be construed as investment advice in any way. Always do your own research or/and consult a qualified investment advisor. It is wise to analyze data from multiple sources and draw your own conclusions based on the soundest principles. Be aware of the risks involved in stock investments.